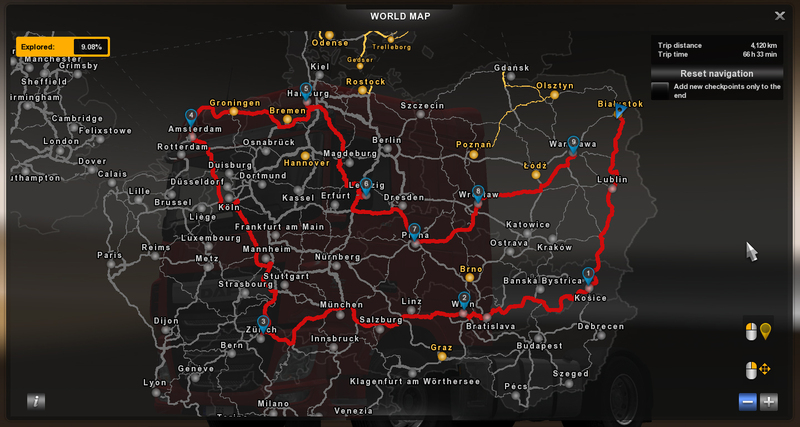 We are happy to announce that open beta of 1.20 Update of Euro Truck Simulator 2 is now available on Steam. or adding waypoints at end of a route. We hope that you will appreciate the flexibility and simplicity of the system, as you can really now create any route you desire. We have received plenty of feedback from our fans in Scandinavia territories that we have the same daylight and night periods in the game as in southern Europe. Well, not any more! To address the problem, we have written new code that positions the sun at the exact astronomically correct place in the sky as you would expect for the given geographical location at the particular time of day. In fact the definitions driving the whole system allow now to set up any location on the globe if anyone would so desire. The new system produces quite different feel of the day cycle depending on whether you are in the north or closer to the equatorial. The sun is higher on the sky at noon in the south than we had it hard-coded before - with appropriately quicker sunrise and sundown - while in the north the sun is correctly following a lower curve in the sky with prolonged evenings and mornings; lingering low at the horizon. 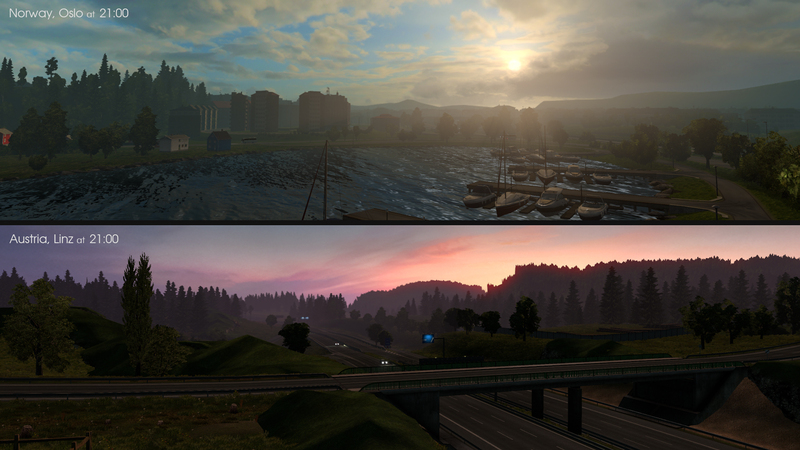 We had to adjust our weather profiles and sky textures to correspond to physical sun location (mod makers beware!). 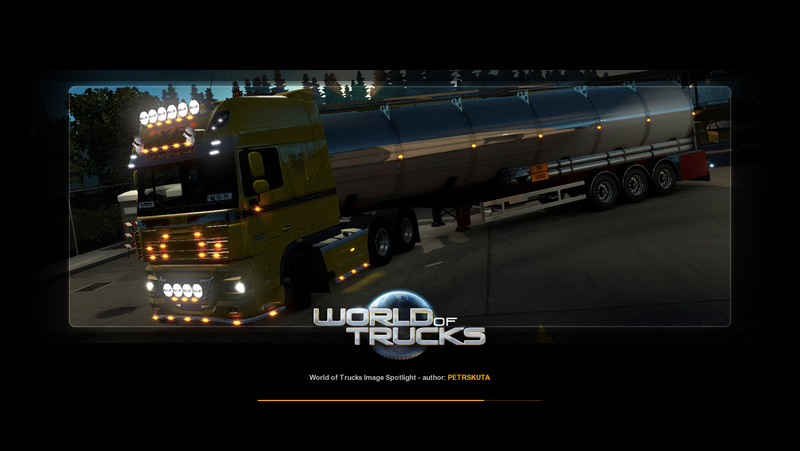 We see so many fantastic community-created screenshots on World of Trucks website uploaded every day, with inspiring content that is leaving us speechless. We felt that these images are so cool that more people should see them, not just regular visitors of the site. We are introducing a new feature - "Image Spotlight." 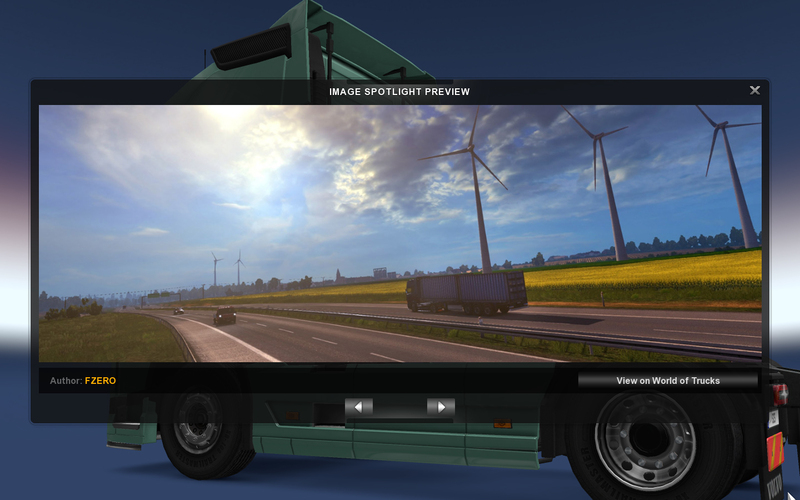 Hand-picked selection of images from World of Trucks will now be made available to the game as additional loading splash-screens. The first batch is there now, we plan to update and refresh the selection from time to time with newly coming images. You can browse the current selection inside the Image Spotlight screen, accessible from the Photo Studio screen, if you want to drill deeper and see the original image in full detail. For this feature to work, you will have to enable it at the game start. We did not want to unleash it at everyone automatically, as the images are downloaded from our server (however just once), and not everybody is comfortable with applications accessing network without their consent. In general, the images had been and will be picked from Editor's Pick from World of Trucks, but that's not necessary a must for the selection in the future. Although there's a huge amount of quality images there, not all of them can go into Image Spotlight for various reasons. For example we have to avoid featuring real brands in the game for which we do not have an explicit licence signed. Also, sometimes even a gorgeous image didn't fit into the aspect of the loading screen for proper composition needs. The code is set to randomly choose between loading screens of the original game and Image Spotlight images. We hope that you will enjoy this little feature as much as we enjoy seeing user created images in the loading screens ourselves. Enabled support for download of additional hand-picked loading screen images from WoTr. All images can be seen using the "Image Spotlight" feature in "Photo Studio".